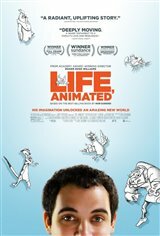 Based on the book by Ron Suskind, this quirky documentary focuses on Ron's real-life son Owen Suskind. An autistic boy who struggled to speak, Owen began memorizing Disney animated films and turned them into a language he used to develop reading, writing, and communication skills. In order to communicate with Owen, the Suskind family was turned into animated characters, speaking in Disney dialogue and song only. This is the inspirational story of a boy who overcame great challenges in order to fully express himself and a family whose love let his imagination run wild.